Hi, I am interested in your 1946 Willys CJ-2A (stock #WWVA560.KT) listed on Autotrader for $14,900. I'd like to get more information about this vehicle and confirm its availability. The Jeep CJ models are both a series and a range of small, open-bodied off-road vehiclesand compact pickup trucks, built and sold by several successive incarnations of the Jeepautomobile marque from 1945 to 1986. The 1945 Willys Jeep was the worlds first mass-produced civilian four-wheel drive car. 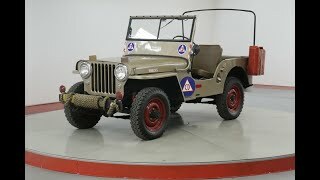 In 1944, Willys-Overland, one of the two main manufacturers of the World War II military Jeep, built the first prototypes for a commercial version the CJ, short for civilian Jeep.2 From then on, all CJ Jeeps consistently had a separate body and frame, rigid live axles with leaf springs both front and rear, a tapering nose design with flared fenders, and a fold-flat windshield, and could be driven without doors. Also, with few exceptions, they had part-time four-wheel drive systems, with the choice of high and low gearing, and open bodies with removable hard or soft tops.